Hi. My name is Debra, and I like chocolate. I realized as I was putting this together this is my third contributing post here in a row at Kitchen Stewardship about chocolate. There were the double chocolate chip cookies, then the chocolate gingerbread truffles, and now these. These are a bit of a different tune than my usual recipes. I am usually all about nourishing and no-fuss foods. While I definitely would not say these are hard to make, they are a labor of love. Also, while the ingredients are natural it is hard to make chocolate covered honey healthy. Healthy? Not exactly. World’s easiest chocolate? Nope. 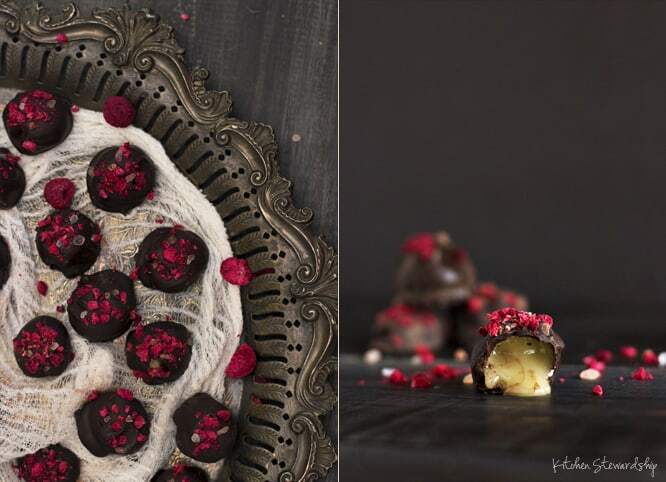 You bite into a shell of bitter chocolate topped with a few crunchy grains of salt and tart dried raspberries and out gushes crystallized honey. Hard to go wrong with that. Plus they are pretty, even when made by a kitchen klutz such as myself! Oh, and lookie there– it is January 28th. Valentines day is just a few weeks away. 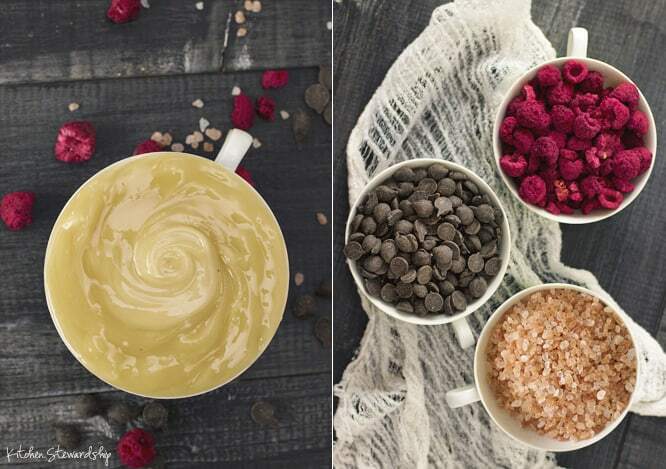 Wouldn’t these natural treats just be perfect? Not saying you can’t make them the rest of the year (in fact I made a version of these for Christmas gifts). 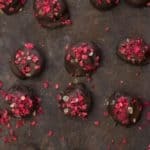 If only my husband didn’t need to be around to hold a fussy baby while I photographed these I would have surprised him with these naturally decorated, and delicious bonbons! I still might. He’d never see something coming he already knew about coming, right? I am trying to grow in my cooking ability and I am working on using fewer ingredients. I tend to cook with huge lists of ingredients, and now I am trying to figure out how to make big flavor with just a few complimentary ingredients rather then the twenty foods I can think of that would compliment each other. This recipe has four ingredients that work together in perfect harmony. The honey– In order for this recipe to work you need crystallized honey (see photo above). I used Eco Bee Farm’s honey from Vitacost for this as it is crystallized and saved my liquid honey for other uses. I am sure most larger health food stores carry crystallized honey. Chocolate- Because the honey is so sweet I feel it really needs a bitter chocolate to balance it. I used 69% chocolate and found that just about perfect. You can go even darker if desired! Tropical Traditions has a great selection of Fair Trade chocolate. 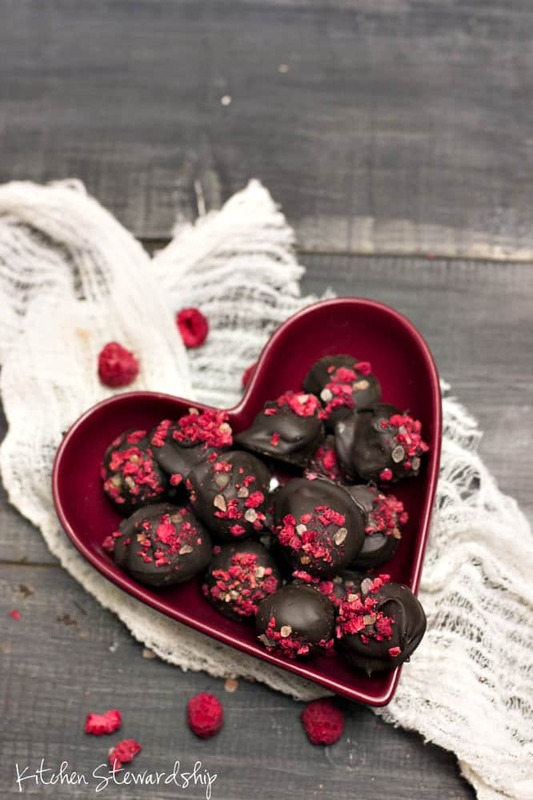 Dried Raspberries- This was my special Valentine twist to these. Freeze dried raspberries crumble easily creating a fun, and naturally beautiful and red, garnish. I originally made them just topped with salt, and that is a delicious option. However, the tartness really added to the mix of ingredients and also helped to balance out the sweetness. It is not an ingredient I use often because of the cost, but a little goes a long way and they last a while. 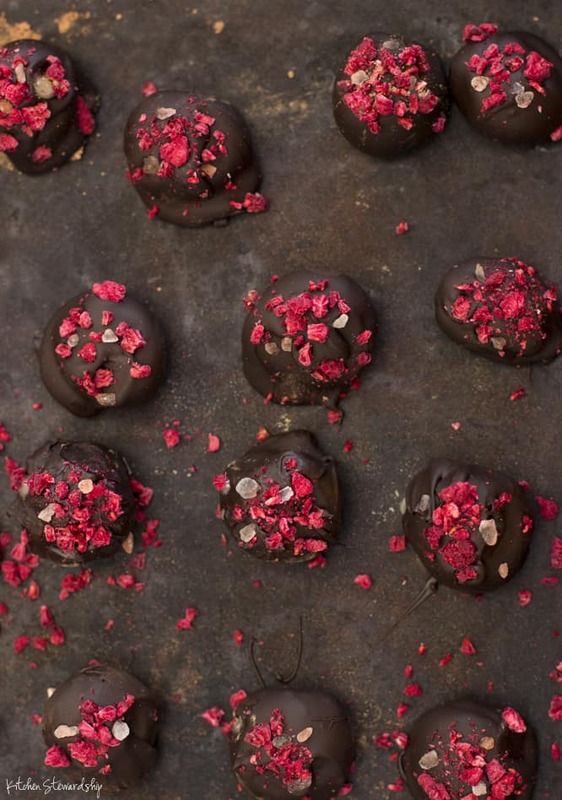 You can omit these to make simple salted bonbons with honey. Salt- I usually use Pink Himalayan salt for topping because it is so pretty and delicious, but any coarse salt will do. It is there to help balance out the sweetness into an addicting sweet and salty bite. Like I said, these are not hard, but they are a labor of love. 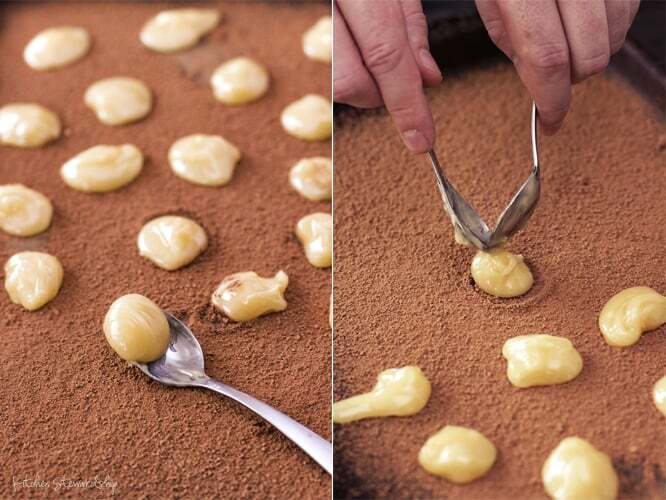 Because you are dipping a goo-ey, sticky, liquid into chocolate it needs to be done in a specific way. Because of this I have step-by-step photos. There is also a recipe box below with measurements and for quick reference. Honey is always sticky; crystallized honey is even more so. My five year old appropriately called it “gooey honey.” The first rule of working with the honey is do not touch the honey! I repeat DO NOT TOUCH THE HONEY. First off you need a place for the little bits of honey to land. Since this will be dipped in chocolate, cocoa makes sense. Sift unsweetened cocoa powder onto a tray/small sheet pan. I recommend only making about 20 so it doesn’t need to be very big. Use a couple of spoons to put small dollops of honey into the cocoa. I didn’t measure as I knew teaspoons would be hard to use, but I guessed them to be between 1/2 and 1 teaspoon. You want them small because honey is so sweet. This is the coolest part! After crystallized honey has been the freezer for a few minutes it becomes moldable! Still incredibly sticky (hence the cocoa), but moldable. Freeze the tray of honey for about 10 minutes. Coat the surface of honey in cocoa (I just folded the disks of honey over). Remember the rule do not touch the honey. After the balls are shaped (and probably flattened some again) put them back in the freezer as you prepare the rest of the ingredients. Also, put a sheet pan (preferable stone) in the freezer to get cold. This will be the landing place for the finished bonbons. Ok, don’t laugh. This is actually an extremely important part of the process. The chocolate needs to be tempered to set up correctly and it needs to be at a fairly cool temperature to not melt the crystallized honey into a mess. In a double boiler over low heat melt chopped chocolate, or chocolate chips, until about 1/2 – 2/3 of the way melted. Remove from the heat and gently stir to melt the rest of the chocolate until it is completely melted and smooth (it will take a minute or two). Test the temperature on your inner wrist, it should be about the same temperature. If all the chocolate melts and it is still hot, simply continue stirring. Note: Here is an explanation on how to properly melt and temper chocolate on YouTube (and here is an explanation of why it is important). Crush the dried raspberries (if using) between your fingers and sprinkle a few pinches of the coarse salt onto a plate. 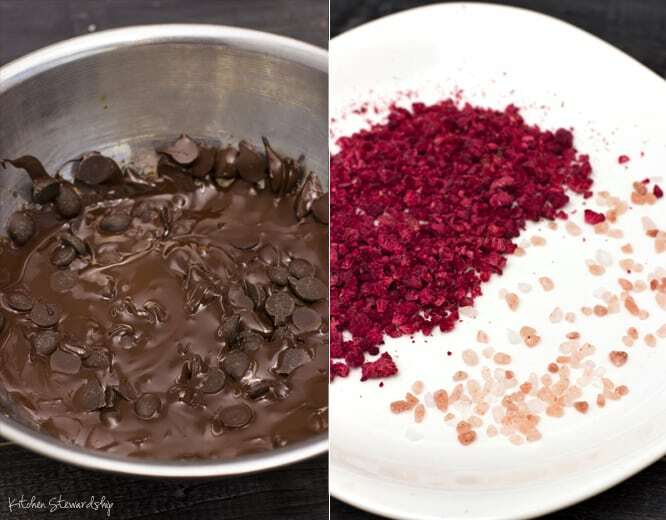 Keep the salt and crushed raspberries handy, the chocolate sets up very quickly. Get the frozen sheet pan, and line with parchment paper if it is not a seasoned stone. Work with just a few of the balls of honey at time (leaving the others in the freezer). Roll into a ball again, as it will have flattened some. 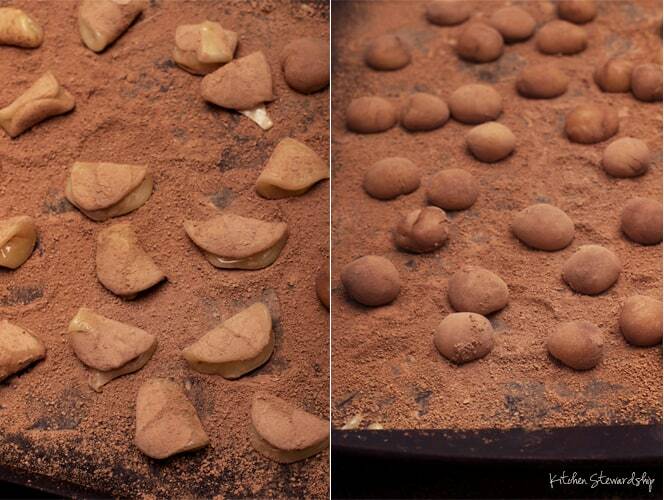 Drop in the bowl of chocolate, fold the chocolate over and move around to coat. Work quickly. Put the dipped honey on the pan being careful not to scrape into the side of the bonbon. Quickly top with a few pieces of salt (I did three of the large grains) and a pinch of the crushed dried raspberries. Gently press the toppings into the chocolate. Bite into a salted chocolate bonbon and find a surprising gooey honey center. Top with dried raspberries for a natural decoration, and delicious tartness. Perfect for Valentine’s Day or any special holiday. Note: Ingredients often use affiliate links to Vitacost and Amazon, but obviously you should shop for the best price and try to keep your dollars local when you can. Evenly sprinkle cocoa powder over small tray/sheet pan. This is for sticky dollops of honey to land into. Using a few very small spoons (egg/tea) scoop out about 1/2 – 1 teaspoon worth of honey. Drop (with the aid of the other spoon) into the cocoa. Make 20 small honey dollops. Do not touch the honey! Put the tray of honey dollops into the freezer and freeze for about 10 minutes. The honey will spread out, fold over so that the honey surface is coated in cocoa (otherwise it wills stick to your hands). Quickly roll the honey into balls. Return tray to freezer. Put a sheet pan (stone is great if you have it) into the freezer to get cold. If it is not a seasoned stone, line with parchment paper. If using bar chocolate, chop it finely. Melt the chocolate in a double boiler over low heat, until 1/2 – 1/3 of the way melted. Remove from the heat and gently stir for a minute or two until completely melted. Test a bit of the chocolate on your inner wrist to see if it is still hot. If it is, continue to stir until it no longer feels hot to the wrist. 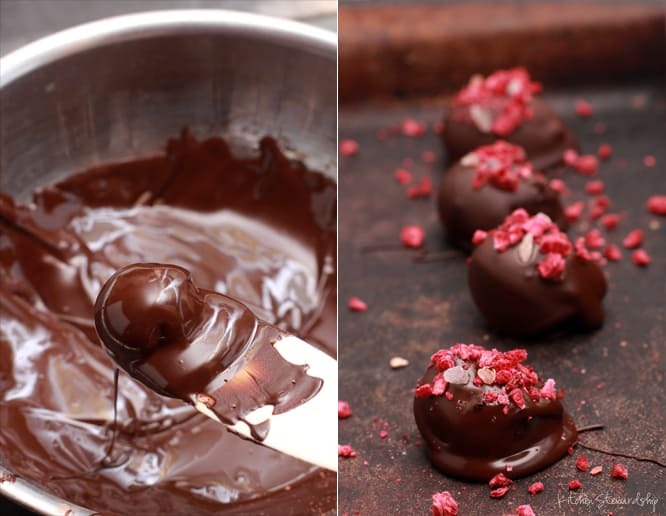 Crush the raspberries and set near the chocolate. Sprinkle out some of the salt on a plate so you can quickly access them. Get the frozen sheet pan out of the oven. Repeat with the remaining honey balls. Be sure to work quickly and with only a few balls of the honey out of the freezer at the time as they get soft very quickly because of the sugar content. Once done you can refrigerate the tray of chocolates for a few minutes to finish setting up quicker, but I do not recommend leaving them in the fridge for more then 10 minutes. Disclosure: This post contains affiliate links to Amazon, Vitacost and Tropical Traditions from which I will earn a commission if you make a purchase. 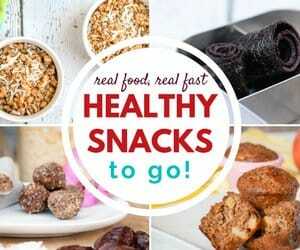 « Previous Post Real Food, Frugal Resources from KS on Sale!